The Republic of Angola is the seventh-largest country in Africa, bordered by Namibia, the DRC and Zambia. The Economy of Angola is one of the fastest-growing in the world while recovering from 27 years of the civil war. High international oil prices and rising oil production have contributed to the very strong economic growth since 1998. From Filing to Registration,18 – 24 months. 10 years with optional 10-year renewal periods. Angola is a First to File country. Complete Patent, 12 – 18 Months. 15 years from date of filing or the PCT International filing date. Registered Design, 12 – 18 Months. The design has an initial term of 5 years from date of filing, with possible extensions of two further terms of 5 years each. 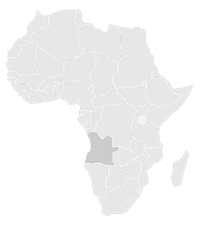 Copyright does NOT have to be registered in Angola. Literary, Musical or Artistic Works – the life of the author plus 50 years following death. Photographic works or Applied Arts – the life of the author plus 25 years following death. Petroleum, uranium, diamonds, gold, bauxite, iron ore, phosphates, feldspar, metal products, fish processing, food processing, brewing, tobacco products, sugar, textiles. Angola is the third largest producer of diamonds in Africa. Petroleum. Iron. China, United States, India, South Africa. China, Portugal, United States, South Africa, Brazil.